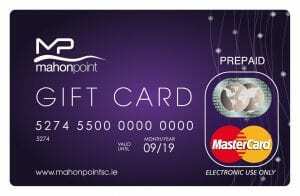 The Mahon Point Gift Card is the perfect gift for all occasions! Gift cards are available online and from the Customer Service Desk at Mahon Point in any denomination from €10 to €1250. 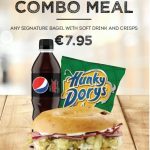 They are redeemable in any shop that accepts Mastercard in Mahon Point Shopping Centre and Retail Park* and gives you complete shopping freedom to purchase and enjoy anything from a burger to a family trip to the Omniplex! Gift Cards are presented in attractive gift card sleeves with space to write your own personal message. Gift cards can be purchased for any value from €10 to €1250. The balance remains on the card for a 12 month period, meaning you can use the card over time until the funds or card expire. A €3 per month management fee applies from month 13 on cards with a positive balance. Balances can be checked online at mahonpointsc.ie, by swiping your card at one of our Wayfinder Kiosks in the Centre, or by calling the number on the back of the card.